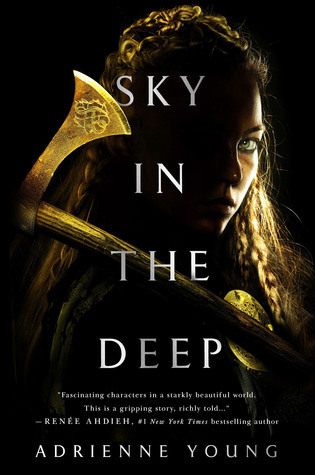 I think that if I had read Sky in the Deep at another time, I would have given it four stars. The plot is totally up my alley, the characters are all so intriguing, and I love the themes that it tackles. But, sadly, I just couldn’t get into it as much as I wanted to. Eelyn, our main character, is from the Aska tribe. The Aska is a Viking tribe that worships the god Sigr. Their enemy is the Riki, a tribe that worships the god Thora. They are opposites, one of water and the other of fire. Five years ago, during a battle with the Riki, Eelyn watches her brother, Iri, fall off a cliff. During another battle, she sees her brother on the side of the Riki. After that, it slowed down for me. The first few chapters were so action-packed that I actually went ahead and bought myself a copy of the book. Yet, once Eelyn gets with the Riki, it slowed down a lot. I wanted something with a lot of action, but it turned into a pondering tribalism, prejudice, and the malleability of identity. Those are great themes. I love reading about them and thinking about them. Tribalism and prejudice are built into us as humans. It kept us alive, kept us wary of others who might harm us and it’s the reason we evolved. But, that doesn’t mean that it’s always the most adaptive thing to do. Identity is something that is also super interesting. It changes as you learn more about yourself, as you gain those helpful insights that allow you to find out who you are. I loved how it juxtaposed the tribalism/prejudice as Eelyn (and Iri, although that’s off-screen) found who they are and broke down the tribal lines between the Aska and Riki. I could write a whole lot more about all of that, but this isn’t a psych paper. They’re just interesting topics and I’m really glad that this book explored this. The story also does deal with romance, and it didn’t work for me. I didn’t feel much chemistry between Eelyn and her love interest. I saw it a mile away — like, right when they started being on the page together — but it didn’t excite me. So, there’s not much to be said about that. Basically, this is a good story. It covers a lot of amazing things. However, I was really in the mood for an action-packed adventure with a lot of fights and battles. Whenever I reread this, I’m sure that my rating will be bumped up to four stars. If you read this, what did you think of it? Were you like me and got a bit disappointed about the lack of epic battles? And the most I know about Viking culture comes from reading Neil Gaiman. I definitely thought it was a strong book and I will read the companion novel!